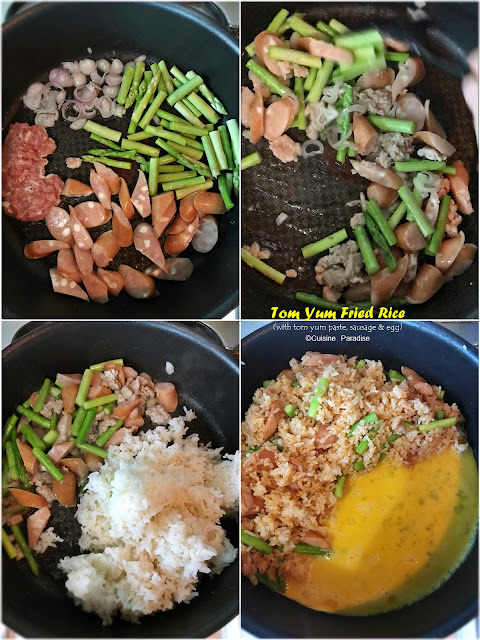 Fried Rice (炒饭) is one of the easiest way to get a quick meal done in less than 15 minutes using whatever "leftover" ingredients that you have in the pantry. 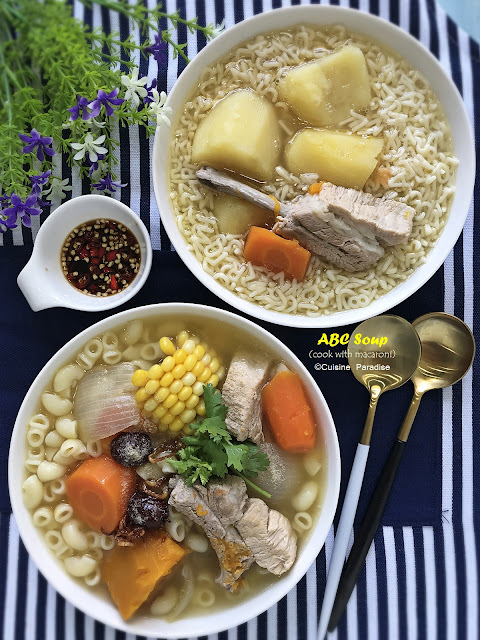 Although the main ingredient used for the following recipes is "cooked chilled rice" but you welcome to replace it with other options such as cooked quinoa, multi-grains or cauliflower. In Korea kimchi fried rice (김치 볶음밥) is normally prepared using two main ingredients such as cooked rice and kimchi. But nowadays with more variety of choices, meat and/or vegetables are also added to give it texture and flavour. Here we added some diced spam ham and minced meat but you can always omit it or replace with other ingredients on hand. 1. Preheat skillet with 1/2 tablespoon of vegetable oil, saute diced spam ham, ground meat (if using), minced garlic and kimchi (separately at one corner each of the pan) on medium low heat for a minute or two. 2. Add rice, kimchi juice and chilli pepper flakes then stir all the ingredients together for about 3 minutes. 3. Drizzle over some sesame oil and light soy sauce to taste before removing skillet from heat. 4. Divide fried rice on serving plates then garnish with toasted sesame seeds, green onion and seaweed strips. Place a sunny-side up egg on top and enjoy. cooked egg on top. Enjoy! 5. 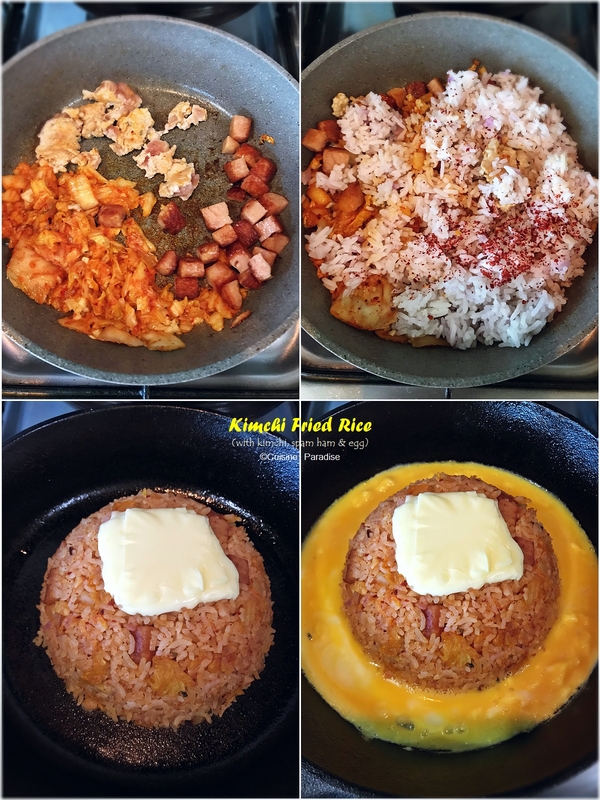 Fill a rice bowl full with kimchi fried rice then turn it upside down on a pan. Pour beaten egg around the edges then top it rice with cheese. 6. Put the lid on to allow cheese to melt and egg to cook through. Remove from heat and serve immediately with handful of salad green on side. Durian season is back in peak during June - August as you can see many durian lovers queuing and grabbing their favourite pick of durian such as D24, D13, Mao Shan Wang, Red Prawn and etc. In Singapore we can even find sweet and savoury food made with durian like ice-cream, cakes, pastry or fried rice. Above is my version of Durian Fried Rice which consists of shrimp and egg together with cooked rice and generous amount of durian pulp. 1. Preheat skillet with 1/2 tablespoon of vegetable oil, saute shrimp and minced garlic on medium low heat for a minute or two until shrimp is almost cooked through. 2. 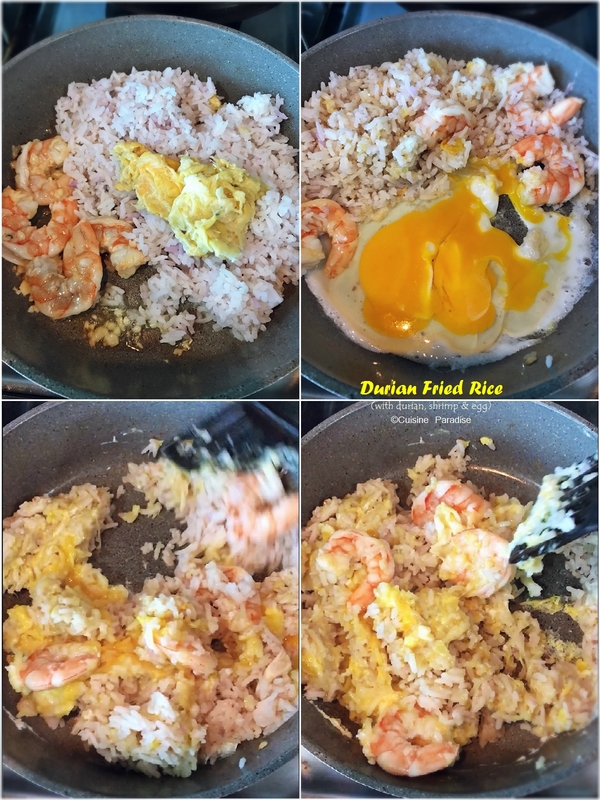 Move shrimps to one corner of the skillet, add rice and loosen the grains using the back of the spatula before adding durian pulp and mix well. 3. Lastly make some space in the skillet, crack in egg and stir through the rice mixture. 4. Divide rice on serving plates and top with extra durian pulp if desire. Otah is a popular Asian snack made with ground fish meat and aromatic spices. The paste is wrapped with either banana or coconut leaf then grilled over a charcoal fire until cooked through. 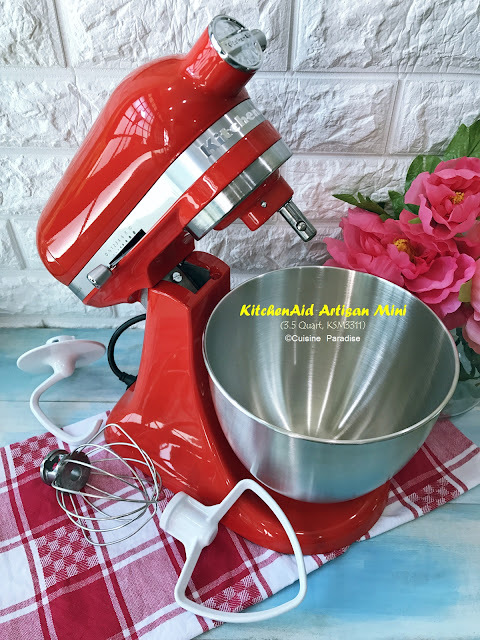 Now you can easily get the ready-packed otah paste in major supermarkets and use it for cooking or making bread or pastry. Here I used otah together with cooked rice, egg and etc to prepare a quick fried rice dish for weeknight dinner. 1. Preheat skillet with 1/2 tablespoon of vegetable oil saute otah, crabstick and asparagus (separately at one corner each of the pan) on medium low heat for a minute or two. 2. Add rice then using the back of the spatula to press and loosen the grains before mixing it with the rest of the ingredients and cook for about 2 minutes. 3. Next make some space in the skillet and pour in beaten egg, let it set and firm up slightly then stir it through the rice mixture. 4. Lastly season rice with some light soy sauce and freshly ground pepper. 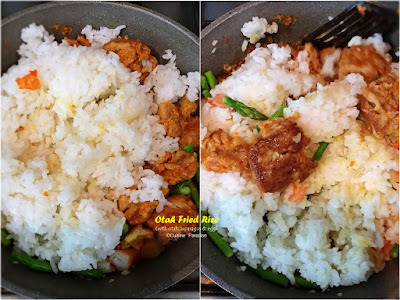 Remove skillet from heat and divide rice on serving plates and enjoy! XO Sauce can be used as as dip or condiment for cooking meat, seafood or even rice or noodles so as to enhance the taste of the dish. In this recipe I am using the homemade dried shrimp XO sauce which is available at the Deli from Goodwood Park Hotel. But you can always replace it with any of your favourite brand of XO sauce when making this dish. 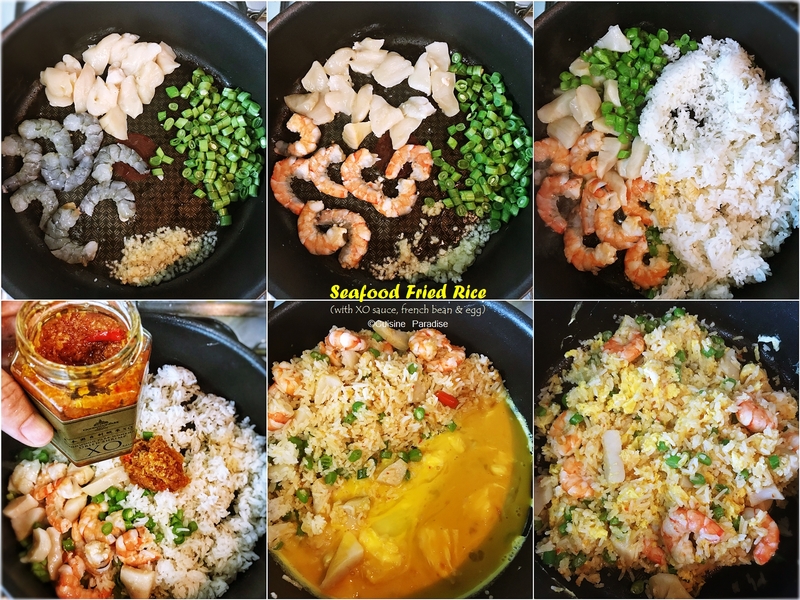 Watch how we prepared this Seafood Fried Rice with XO Sauce. 1. Preheat skillet with 1/2 tablespoon of vegetable oil saute minced garlic, shrimp, scallop and longbean (separately at one corner each of the pan) on medium low heat for a minute or two till seafood is almost cooked. 3. Next stir XO sauce into rice mixture till combined then make some space in the skillet and pour in beaten egg, let it set and firm up slightly before mixing it with rice. 4. Lastly season rice with some freshly ground pepper. 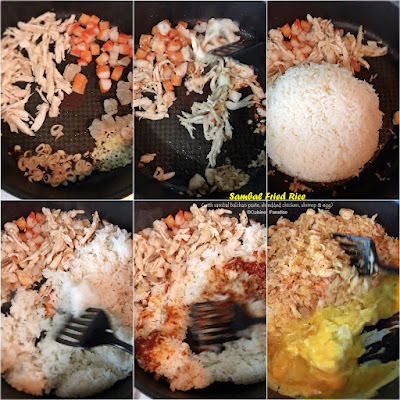 Remove skillet from heat and divide rice on serving plates and enjoy! There are a few brands of XO Sauce available in the supermarkets and sometime you can even purchase it off shelf from some Chinese restaurant too. This flavourful and spicy seafood sauce is mainly made of dried scallop and shrimp together with chilli, onion and seasoning. Although this is not the authentic way of preparing Tom Yum fried rice with lemongrass, lime and Thai chilli paste but the adding of ready-made tom yum paste is also good enough to replicate this quick Thai dish in just a few minutes. Besides fried rice you might want to check out "here" another 3 easily prepared Thai dishes to impress your loved ones. Watch how we prepared this Tom Yum Fried Rice. 1. Preheat skillet with 1/2 tablespoon of vegetable oil saute minced garlic, shallot, sausage, ground meat and asparagus (separately at one corner each of the pan) on medium low heat for a minute or two till meat is a cooked. 2. Add rice then using the back of the spatula to press and loosen the grains before mixing it with the rest of the ingredients and cook 2 minutes. 3. Next stir Tom Yum Paste into rice mixture till combined then make some space in the skillet and pour in beaten egg, let it set and firm up slightly before mixing it with rice. 4. Lastly season rice with some freshly ground pepper and kaffir lime leave. Remove skillet from heat, divide rice on serving plates and enjoy! Watch how we prepared this Sambal Fried Rice. 1. Preheat skillet with 1/2 tablespoon of vegetable oil saute minced garlic, shallot, shrimp, imitation crabstick and chicken (separately at one corner each of the pan) on medium low heat for a minute or two till prawn is almost cooked. 3. Next stir Sambal Chilli into rice mixture till combined then make some space in the skillet and pour in beaten egg, let it set and firm up slightly before mixing it with rice. Here is an example of the sambal chilli paste which I used for the fried rice recipe. If you are looking for something spicy perhaps you can consider adding 1-2 spoonful of sambal chilli or sambal blachan to season the fried rice. You will surprised how delicious the rice end up even without any side ingredients. The cooked chilled rice, egg and sambal chilli makes a perfect combination when you run out of ingredients for a quick meal. 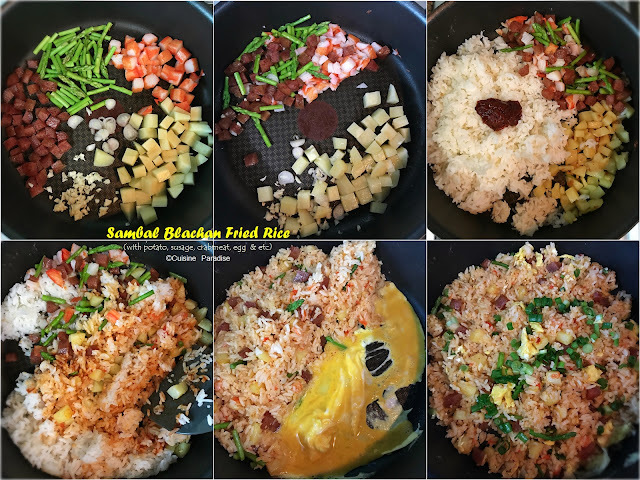 Watch how we prepared this Sambal Blachan Fried Rice. 1. Preheat skillet with 1/2 tablespoon of vegetable oil saute minced garlic, shallot and diced potato (separately at one corner each of the pan) on medium low heat for 3 minutes till potato is slightly soft. Add in preserved sausage, crabstick and asparagus then cook for another minute. 3. Next stir Sambal Blachan into rice mixture till combined then make some space in the skillet and pour in beaten egg, let it set and firm up slightly before mixing it with rice. 4. Lastly season rice with some freshly ground pepper and chopped scallion. Remove skillet from heat and divide rice on serving plates and enjoy! 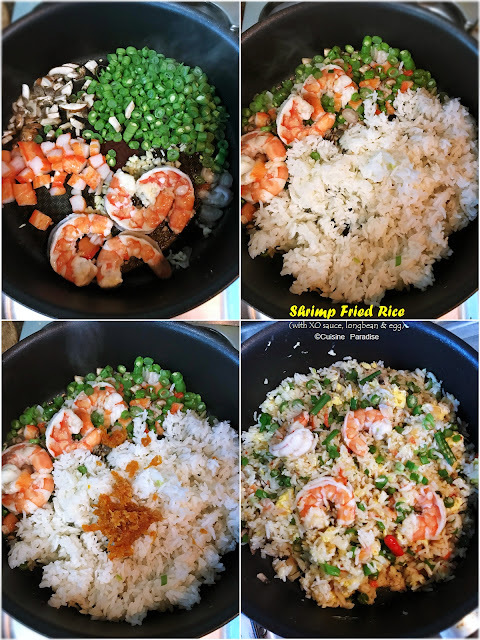 There are a few ways and tricks to prepare a good fried rice and I am sure through practice you can get the hand of it with your own methods. For me as a homecook; a non-stick pan (preferably for heavy duty used), cooked chilled rice (I just cooked the rice 2 hours before cooking then left it cool down at room temperature and chilled before using) and decent amount of oil and heat control.